Now you can relax with a delicious cup of coffee, while Hoppy’s Carwash & Café takes care of your car. Perfect for all those time poor, on-the-go customers looking for a great quality, friendly service hand car wash. With multiple wash options and specialty services available, we are sure to have everything that your car needs to drive away pristine clean. Hoppy’s Full Service Hand Car Wash is designed for those looking for a safe, hands-on car wash, with the convenience of not having to do it yourself. All of our Hand Car Wash locations offer the comfort of a café. So, you can sit back, relax, read the paper, grab a coffee and a snack, while we take care of your car for you. It’s the perfect convenient service to beat the hot days of our Gold Coast and Brisbane weather, stay out of the sun, and enjoy an air-conditioned wait at our delicious café. Each of our Hoppy’s Full Service Hand Car Wash & Café locations also offer a vast range of car detailing options. From exterior paint protection to interior leather clean, we have everything you need to restore your car to that showroom shine. All you have to do is drive in, speak to our Greeter about your car cleaning needs, relax in our casual café while you wait and then drive away clean. For more information, a full service and options list and pricing, please see our Wash Menu . Our easily accessible locations make your stop an easy choice, whenever is most convenient for you. Plus, all of our Gold Coast and Brisbane Full Service Hand Car Wash locations utilise quality, local, PH neutral, biodegradable products, in order to assure an exceptional quality finish, every time. Hoppy’s Carwash & Café has over 15 years of experience and are current members of the Australian Carwash Association as well as the International Carwash Association. Our dedication to delivering a hand car wash service that is convenient, quality assured, completely car safe and environmentally friendly, makes us the first-choice in car wash and car detailing across Queensland’s East Coast. If you’re not 100% satisfied with your Hand Car Wash, simply bring your vehicle back to us within 24 hours, for the manager to assess and rectify where appropriate. If it rains within 24 hours of your ‘Super Wash’, you can bring your car back in within seven days of your wash and receive a complimentary ‘Exterior Wash’. We guarantee all of our Hand Car Wash services, which means if you’re not happy, we’re not done! All of our conveniently situated Hoppy’s Carwash & Café locations also offer dog wash bays, so that your pup can look and smell as fresh as your car. 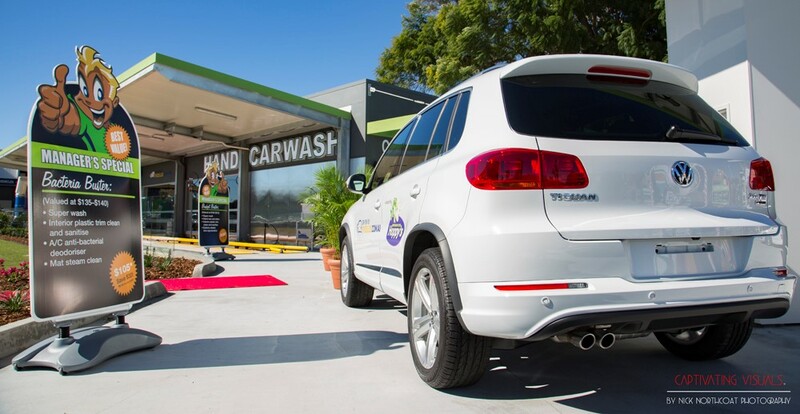 Visit Hoppy’s Carwash & Café at Bowen Hills, Toowong, Norman Park, Mermaid Beach or Southport for a Full Service Hand Car Wash that you will come back to every time.